Dunvegan Castle can be found on the Eastern shore of the Isle of Skye off the west coast of Scotland. It has the honour of being the oldest inhabited castle in Scotland and is the seat (ancestral home) of the Clan MacLeod. 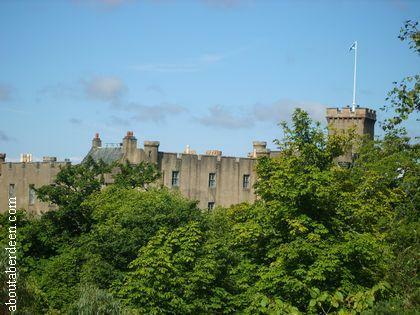 Other Scottish castles have been entrusted to The National Trust for Scotland, but not Dunvegan Castle which remains a private castle for the MacLeod family, though visitors can visit and tour the castle. Like most historic buildings it is said to be haunted. 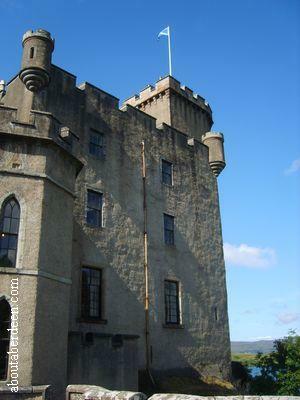 Dunvegan Castle holds the Fairy Flag of the MacLeod's which was given to the Clan who helped a Fairy Queen. It is said to help the Clan in times of need if waved but can only be used three times. So far it has been used twice. It can only be used if a year and one day has been passed between uses. The Clan used it first at a battle at Glendale in 1490 and again in battle at Trumpan in 1580. Both times the Clan MacLeod won their battles. The book Wolf Notes and Other Musical Mishaps (Kelpies) by Lari Don is a children's story about a break in at Dunvegan Castle to steal the Fairy Flag. Other stories by Lari Don include First Aid for Fairies and Other Fabled Beasts and Tam O'Shanter (Reloaded). The first ghosts of Dunvegan Castle are thought to be related to the Fairy Flag of the MacLeod's. It is sometimes spelt the Fairie Flag of Dunvegan. Ghostly music has been heard coming from the drawing room in which the flag is stored. No source of the music can be found but those who have heard the ghost music played have described it as being very beautiful. The Fairy Flag was analysed by the South Kensington Museum at the request of Sir Reginald MacLeod who was the 27th Clan Chief. The analysis revealed that the material of the Fairy Flag was silk that had been woven in either Syria and Rhodes and may have been taken to the Isle of Skye from the Crusades. No phantom piper has been seen but bagpipe music had been heard being played by a ghost in the South Tower. There are other legends surrounding the Fairy Flag of Dunvegan. The first legend is that a MacLeod was sheltered by a hermit during the Holy Land crusade. The hermit told the crusader about the evil spirit of a pass he had to cross. He was able to kill the evil spirit and before she died she revealed to him the future of the clan and told him to make a banner from her girdle and a spear out of her staff. 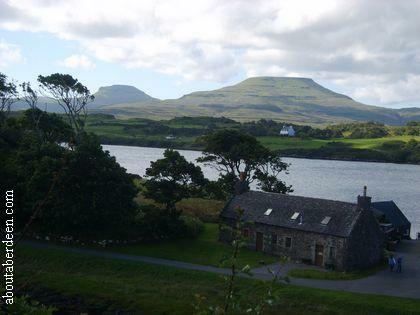 In his book Isles of Skye and Raasay (Landmark Visitors Guide) Glenn Heritage recommends travelling along the B884 to Uiginish for a perfect view across Loch Dunvegan and Castle Dunvegan. 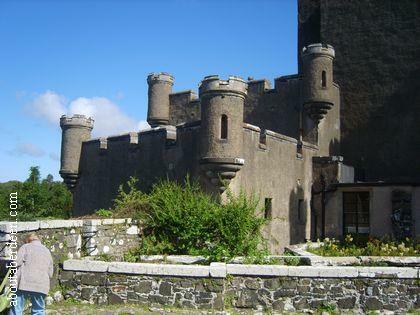 There is plenty of parking at Dunvegan Castle with a separate disabled car park next to the shop, cafe and toilets. 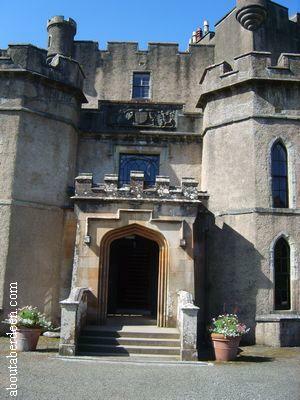 Entry to Dunvegan castle is by the gates across the road and admission tickets have to be purchased at the hut. 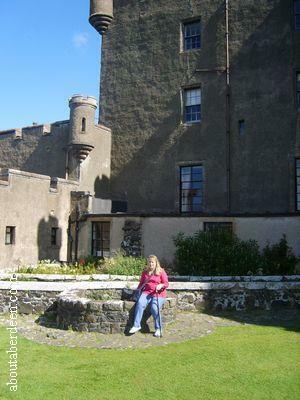 At the time of writing this Dunvegan Castle review the prices were £7-50 for an adult and £4 for a child with a family ticket costing £20. 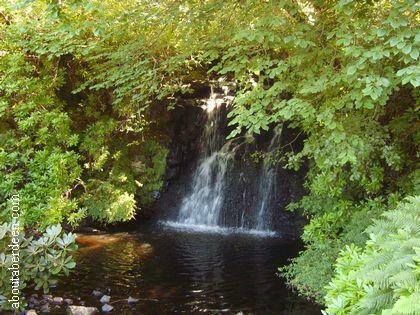 There are discounted for groups and senior citizens and for those just wanting to visit the Dunvegan castle gardens. Dunvegancastle.com has up to date prices and opening times which at the time of writing this tour of Dunvegan Castle was from late March to mid October from 10am until 5:30pm with a last entry at 5pm. A guidebook is available to purchase at the gate hut. 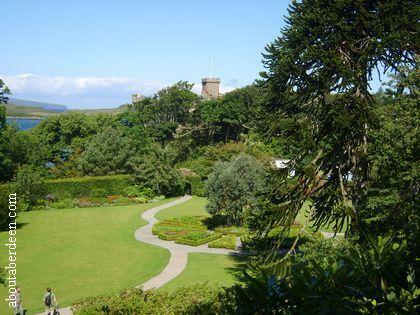 There is a short walk through the gardens to get to Dunvegan Castle and then some steps into the reception hall. There are further stairs inside and because it is a historic building there appears not to be disabled access. 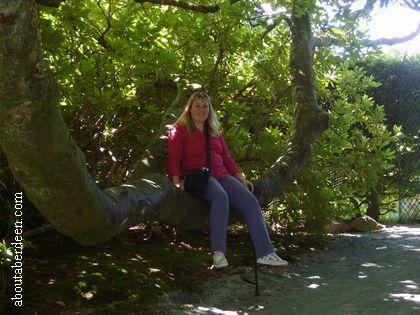 The gardens so have disabled access for wheelchair users though. Taking photographs is not permitted inside Dunvegan Castle but the guidebook has some stunning pictures. 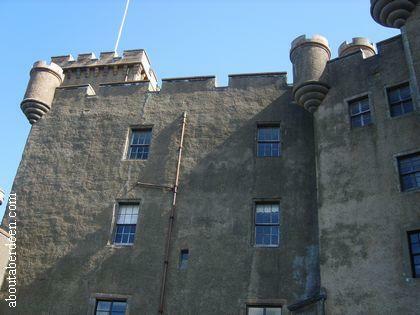 During the tour of Dunvegan Castle visitors work their way through various rooms such as the Keep, Fairy Tower, Rory Mor House which is now the Dining Room, the Piper's Gallery, the Library and the Dungeon. This is located next to the Drawing Room and the stairs to the Kitchen so that prisoners could smell the food as they slowly starved to death - if they survived being thrown down into this 13 feet deep pit. Modern visitors can hear a recording of the cries and coughs of prisoners as they were subjected to this sensory torture. Visitors can view many family and clan relics and items of historic value such as paintings, weapons, furniture, books and the fairy flag which is mounted and framed to preserve it because it has become quite decayed over the centuries. The North Room windows give some stunning views across Loch Dunvegan. The North Room contains the ornate Dunvegan Cup which was presented to Rory Mor by the O'Neils of Ulster in 1595 for his services during their wars with Queen Elizabeth I. Another object of interest is Rory Mor's Horn which was used to test the manhood of Chiefs. They had to be able to drink the contents, one and three quarters of claret, in one go without pause or falling down. The Dunvegan Charter, Dunvegan Armorial and a set of MacCrimmon pipes are housed in the North Room. Jacobite relics can also be found in the North Room and these include the stays and pin cushion of Flora McDonald and a lock of Bonnie Prince Charlie's hair given to her. Many of the MacLeod's were supporters of Bonnie Prince Charlie, but the Chief was not. He was one of the men who led the hunt for the Prince who was being led to safety by Flora McDonald. Years later her daughter married the Tutor to the Chief of MacLeod and Flora McDonald stayed at Castle Dunvegan for some years. The elephant tusk in the North Room was donated to the castle collection by the hunter Arthur Henry Neumann who wrote a book about elephant hunting whilst at Dunvegan Castle. There is also a lion portrait though little is know of the history of this painting. A video presentation by the current Chief plays in a cinema room where he describes his family history. Next door is another souvenir and gift shop. Along this corridor are some historical photographs of St Kilda which was once part of the land owned by the MacLeods. In the former kitchens are relics of the Pictish past of the area including a Pictish symbol stone. The Great Sword of Dunvegan is housed here. The tour of Dunvegan Castle continues outside to the well in the Gun Court. The tour of Dunvegan Castle took aboutaberdeen.com about one hour with a further hour in the Castle Gardens. 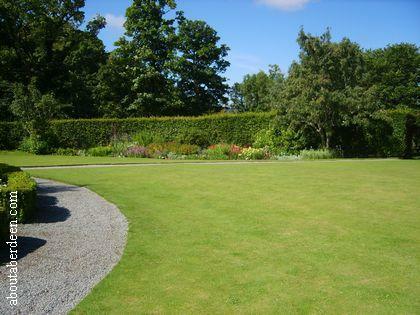 The Dunvegan Gardens are well maintained, beautiful and relaxing. The walled garden is split into themed sections with statues and outdoor artwork. 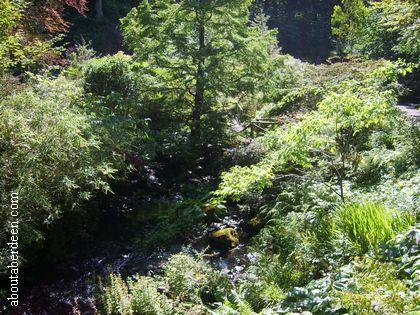 There are two forest walks around the Dunvegan Gardens and these are signposted for a short and long walk. They both take you to the Dunvegan waterfall and burn. Visitor toilets can be found at the start of the tour of the Dunvegan Gardens. Dunvegan Castle dates back to the 9th century. The motto of the MacLeod Clan is Hold Fast and this has been upkept throughout the history of Dunvegan Castle. The head of a bull can be seen on the wall of the reception hall of Dunvegan Castle. Unfortunately photography is not permitted within Dunvegan Castle so aboutaberdeen have been unable to take a photo of the bull, though their is a diagram of it's motif in the guide book. Dunvegan Castle was built on a strategic rock to offer defensive positions by Loch Dunvegan. A fresh water well was located by the intended building plot of the original Leod Fort from the 13th century. It is thought that an earlier fort in the area dates back to the third century. The trusted pipers to the MacLeod clan were the MacCrimmons who served for thirteen generations. During their tour of the Highlands of Scotland and the Hebrides James Boswell and Dr Johnson visited Dunvegan Castle on the Isle of Skye in 1773. The portrait of Dr Samuel Johnson along with a letter he wrote to Lady MacLeod is on display. The 23rd Chief was nicknamed The General because this was his rank when he served in India. He upgraded the castle from a Mediaeval building into a building more comfortable for his wife Sarah and their children. This included the building of the Drawing Room, the re-roofing of the Keep and the building of a Barrack Block for his private army. 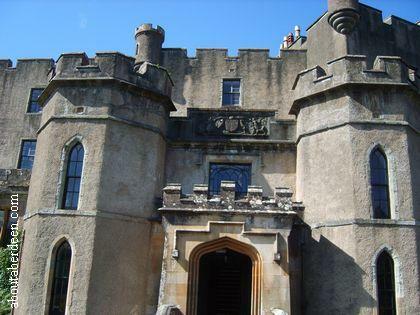 During his visit in 1814 Sir Walter Scott penned Dunvegan Castle The Lord of the Isles. A letter from Sir Walter Scott is on display in the Business Room. Restoration work was carried out between 1840 and 1850 by Robert Brown of Edinburgh. 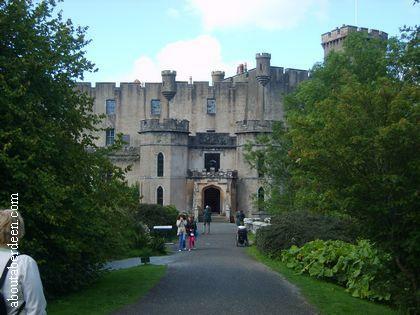 The 25th Chief of the MacLeods had to leave Dunvegan Castle due to the stress of providing work and food for his people during the 1847 to 1851 potato famine. He had to sell off large parts of Clan land and then took work as a clerk in London. Financial problems followed the family and they were unable to return to Dunvegan Castle until 1929 when the 27th Chief returned to the ancestral home. The 28th Chief was Dame Flora MacLeod of MacLeod (1878 to 1976). The Business Room is named after her because she would meet her clansmen and women here. 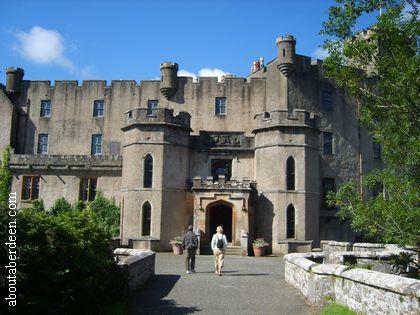 Dunvegan Castle was first open to the public, for charity, in 1933. A fire in 1938 destroyed the South Wing of Dunvegan Castle. Her Majesty Queen Elizabeth II visited Dunvegan Castle on the 14 August 1956 and in the evening the Clan MacLeod representatives from around the world were treated to a banquet. This was to celebrate the coming of age of the Hugh MacLeod of MacLeod the 30th Chief. Since then Clan MacLeod Parliaments have been held every four years. The present Chief is Hugh MacLeod, the 30th Chief MacLeod.